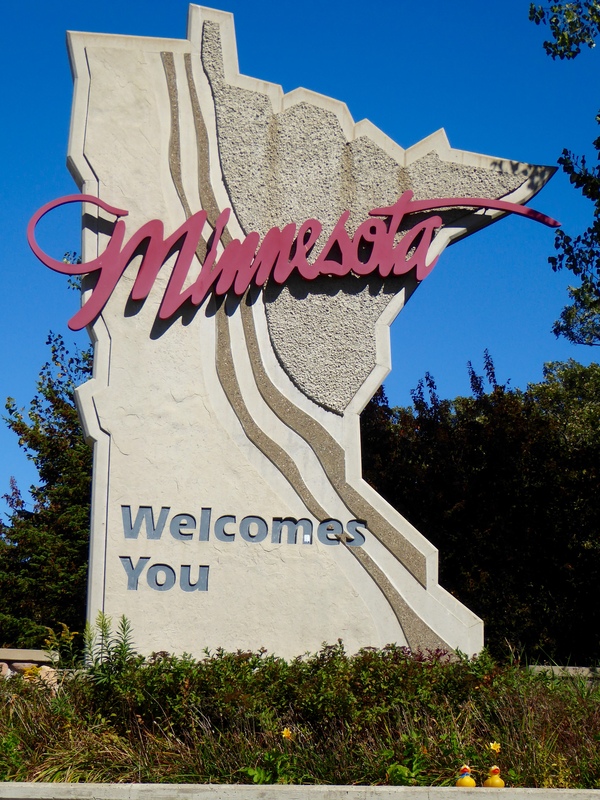 We are now in Minnesota. 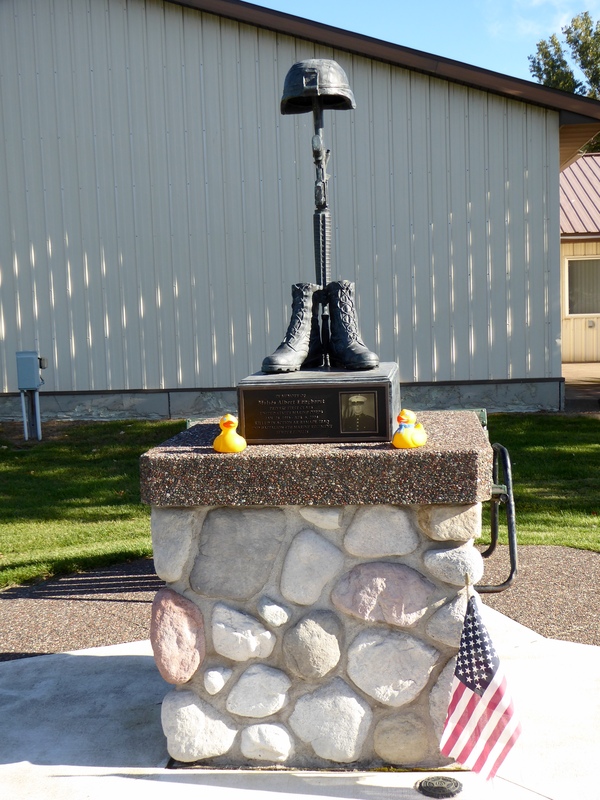 Soapy Smith Duck and his parents go to Minnesota, but this is the first time for Zeb. Southern Minnesota is like Iowa. 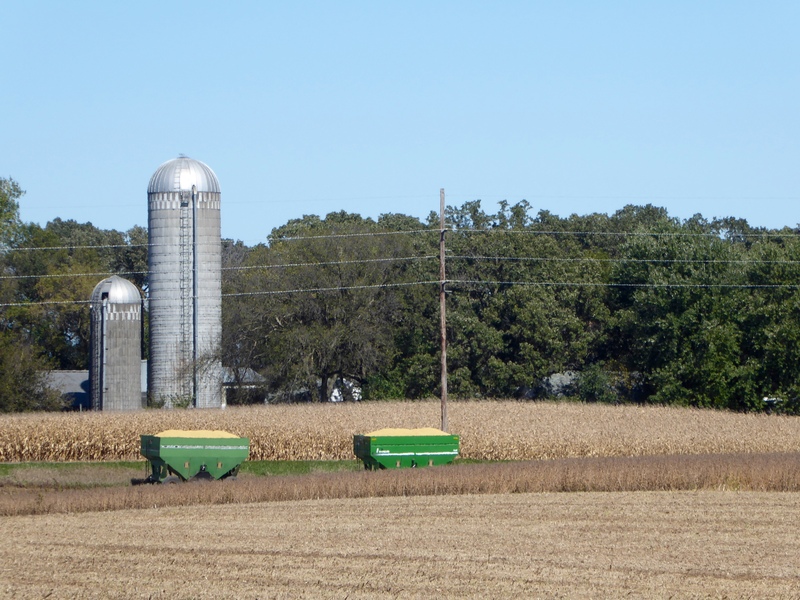 We like this farm where the farmer has put grain in these cars for transport. We stopped at the town of Moose Lake, Minnesota. This rest park is dedicated to Deputy Sheriff, Ervid T. Clemons He was killed while on duty August 26, 1993. 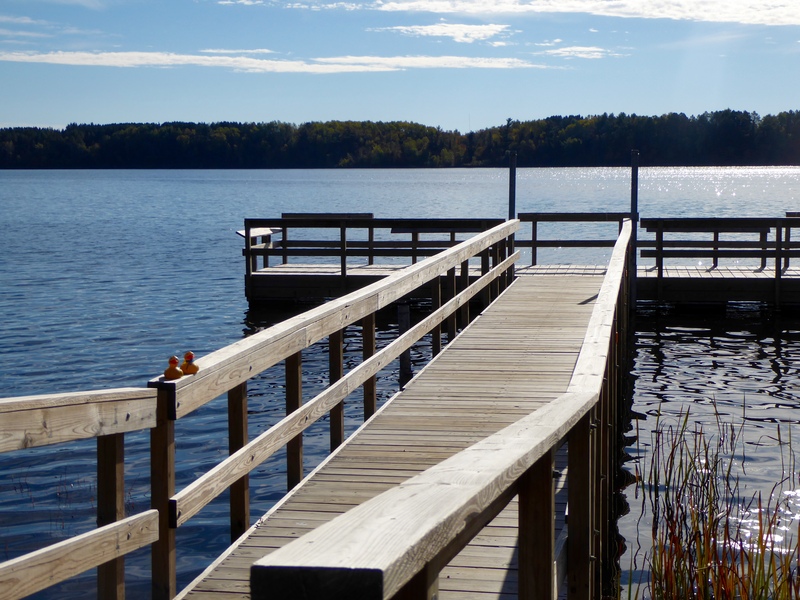 We like this pier going over the Moose Horn River. 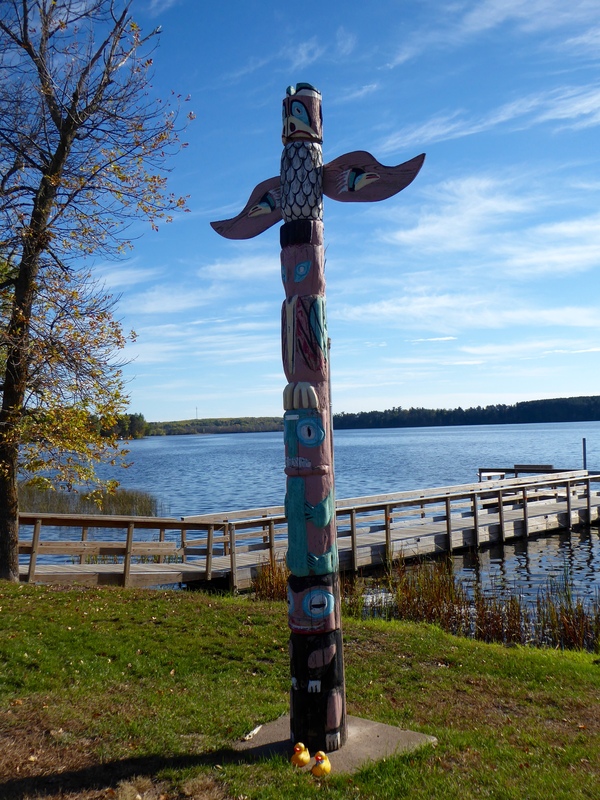 Isn’t this a great totem pole? We like it in this park by the river. Nearby is the memorial for Moises Albert Langhorst, Private First Class, US Marine Corps. He gave his life April 16, 2004 in Ramadi, Iraq. We like parks and memorials to remember and honor those who gave their lives to preserve our way of life. We are now in Duluth, Minnesota. Duluth is a major seaport on Lake Superior. 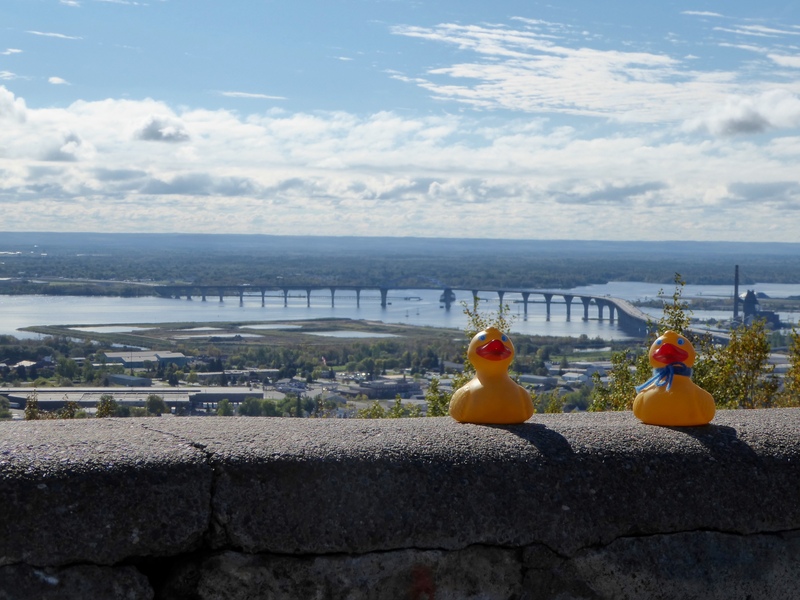 You will remember that the five Great Lakes between the United States and Canada are all connected, and further connected by the St. Lawrence Seaway, to the Atlantic Ocean. That is why a city so far from the ocean can be a major seaport. We drove on the Scenic Skyline Parkway overlooking Lake Superior. 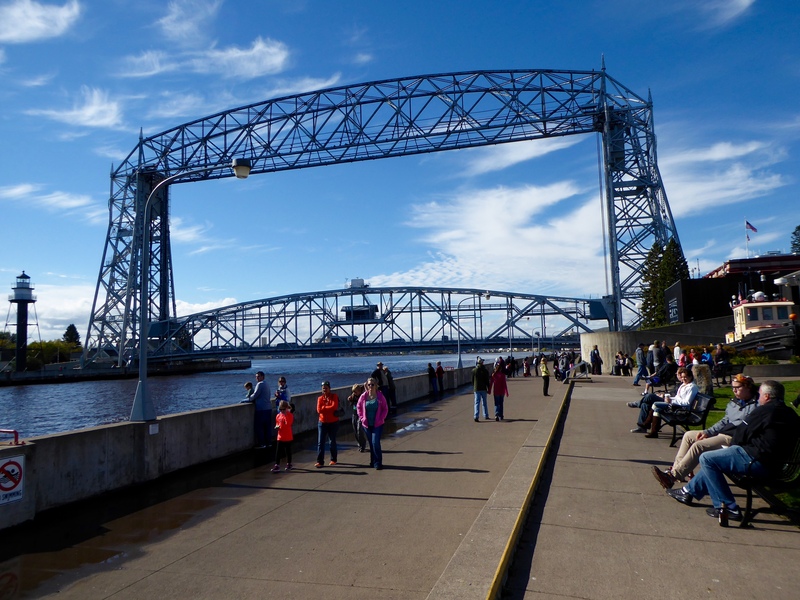 The bridge we see connects Duluth, Minnesota and Superior, Wisconsin. Later we drove across that bridge. The Scenic Skyline Parkway did provide great views of Lake Superior and the hills of Duluth. 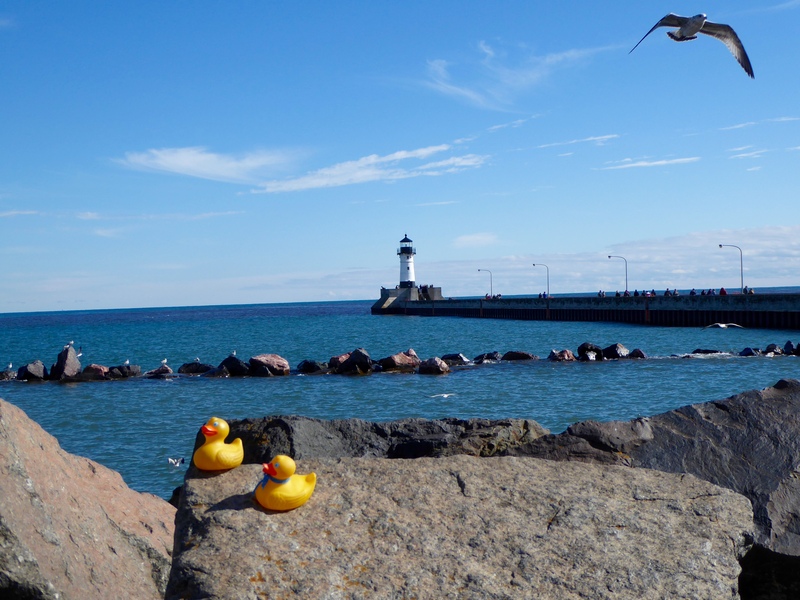 No we are back in Duluth at the waterfront. This is the Historic Canal Park and a major tourist area. Humans can follow the sidewalk and walk to this lighthouse. 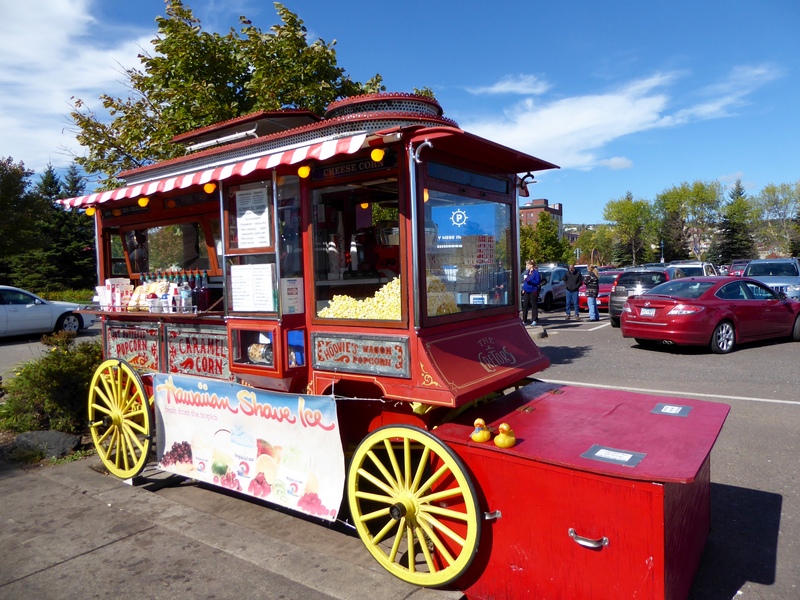 Humans can also rent these bicycle carts. 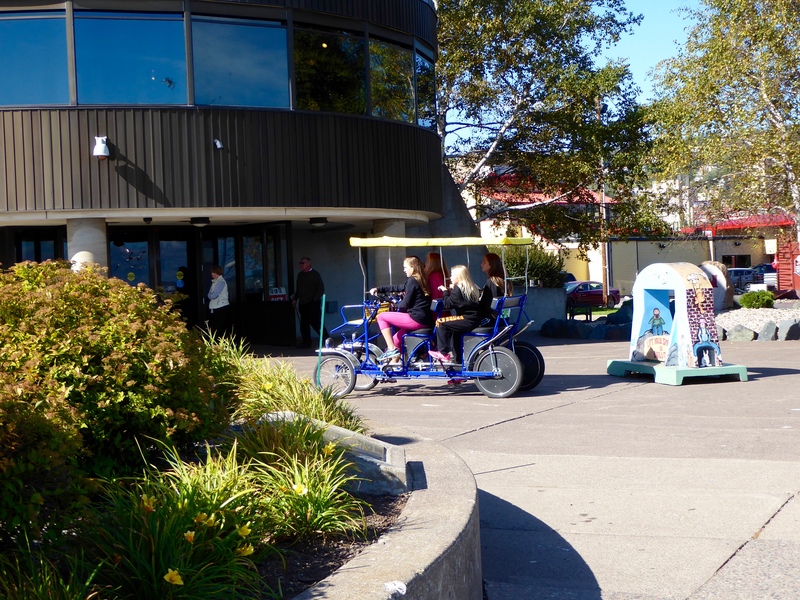 Many have three benches so 6 people can help pedal around Canal Park. Much of this park was built and is maintained by the US Army Corps of Engineers. 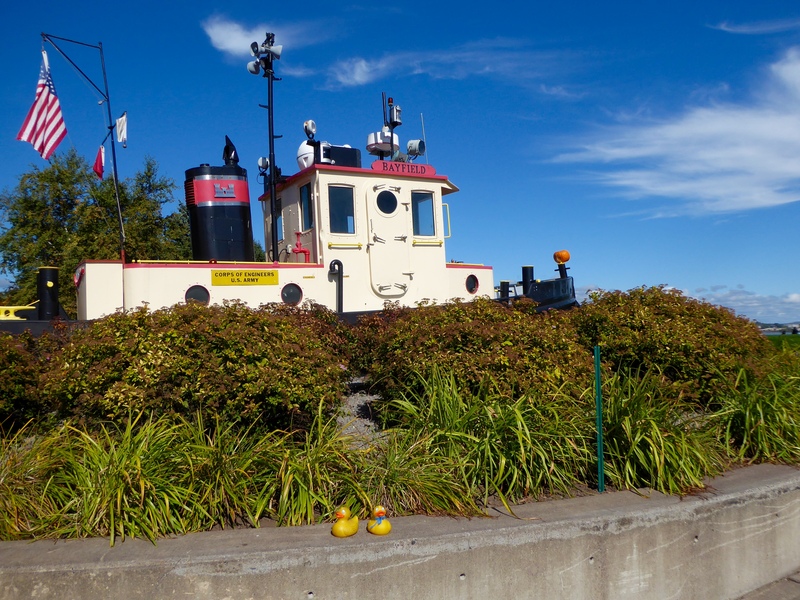 We liked the tug boat from the US Army Corps of Engineers. This is a special type of bridge. 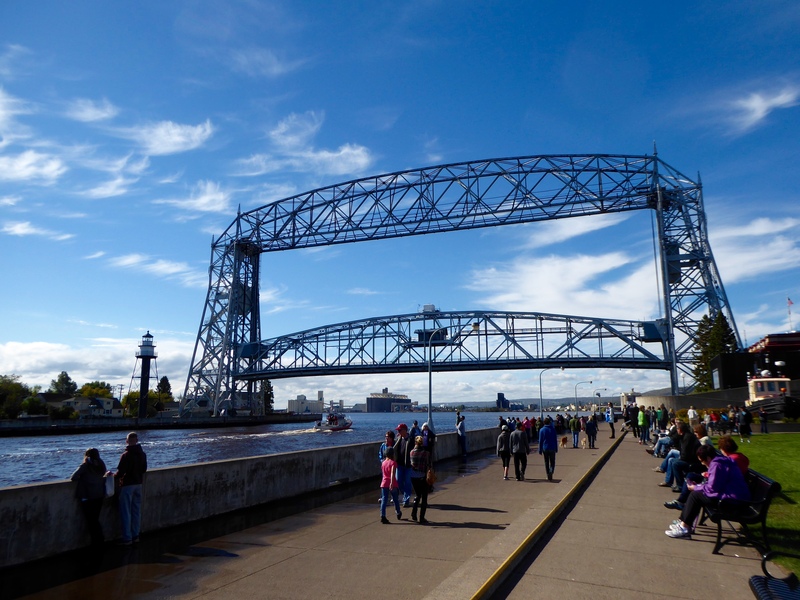 This is the Aerial Lift Bridge. Now the bottom layer is lifted to allow a boat to pass under the bridge. When the boat has passed, the bottom layer is lowered for cars and pedestrians to cross the bridge. This bridge, completed in 1905, is the oldest structural landmark in the city. Improvements were done in 1929. The bridge has a clearance of 180 feet, a span length of 386 feet and weighs 900 tons. We liked this bridge, but those boats sure do have loud horn blasts when they have passed. We are going to Wisconsin soon, but in a few days we will return to see more of northern Minnesota. It is really nice here. We like it and know you would like it also.